We all know, printed books are a tiny bit “old style”. Nowadays we prefer video tutorials on DVD, workshops abroad or online webinars, whenever we want to learn something from someone who knows. That’s fine with me. However, when you consider the value for money, a well written book is so much more economical than DVD tutorials, online-webinars or workshops abroad. Most patients with a serious and severe migraine problem are exceptionally suspicious, doubting their own judgment and observation. That is no wonder, given the countless well-meaning disappointments, fraudulent inadequacies, outright con-schemes and walloping lies they’ve experienced over the years. We know that and we understand that. 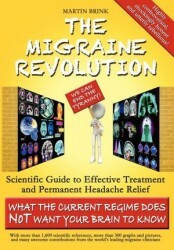 Our Scientific Patient Guide can be ordered from most bookstores world wide. To make things easier for you, we’ve listed the main sellers and prepared a link to the respective site. Now rush and order your copy! "The book that I'd been waiting for."